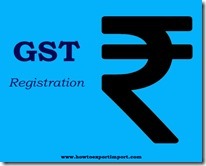 Is more than one registration allowed under GST? (2) For the purpose of recovery of dues, all business verticals, though separately registered, will be considered as a single legal entity. JAGDISH PATEL: On 04 July 2017 if am a transporter (goods transporter) can i have to get registration under gst as my services is payable on rcm to my client why should i get gst number ? Rajeswari: On 16 December 2017 one PAN can i register multi GST registration is possible?